Jan Marini Age Intervention : A dramatic new concept in anti-aging technology created especially for a woman. Age Intervention combines a number of agents that are specifically designed to target female skin changes due to the gradual drop in estrogen production along with cumulative sun damage, resulting in noticeably younger-looking skin. 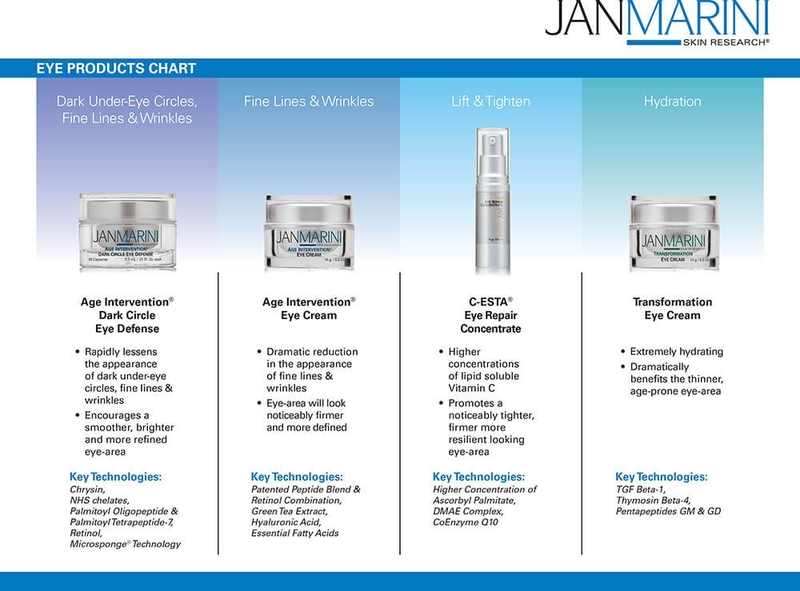 Jan Marini Age Intervention Eye Cream is a spectacularly effective formula that delivers amazing results. For ultra smooth, contoured-looking eyelid skin that appears flawlessly ageless, Age Intervention Eye Cream is a must-have formula. The results are visibly exciting and objectively measurable. Apply small amount around eye area, do not apply on the eyelids. Use once or twice daily.